About this time in 2001, the Cold Spring Maennerchor visited Oktoberfest in Munich Germany as a part of their EURO III tour. Here's what it looks and sounds like to be in a Oktoberfest "Beer Tent" and to sing, drink, eat and dance the way the German's have done for over 170 years. This story is sponsored by the Bagel & Brew in Cold Spring. They are having their own Oktoberfest on Friday and Saturday this coming weekend, September 23rd and 24th. They're putting up a "Big Top" tent in the parking lot, bringing in the Gluek beer wagon and serving all kinds of great German food. There will be live music, dancing and singing. Should be a fun time for all. Oktoberfest began this past weekend in Munich Germany. 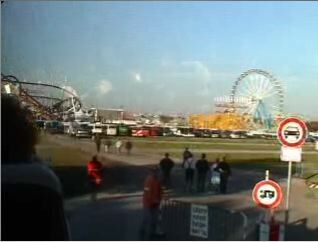 This is the 172nd time the festival has been held which is attended by 6 million visitors each year. During the two week festival visitors will drink more than 5 million liters of beer and consume over 200,000 pairs of pork sausages - mostly in the "beer tents" put up by the traditional Munich breweries. 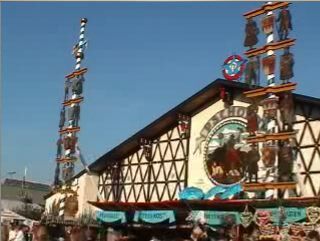 Also as a part of the huge Oktoberfest grounds there is a wide variety carousels, roller coasters and all the spectacular fun of the fair. 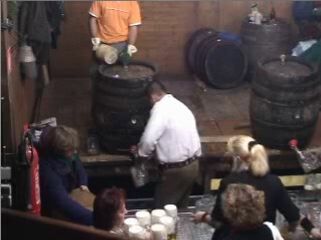 The beer is served direct out of 100 liter draft wooden barrels. Beer Frauleins then carry the beer in groups of 5 to 7 to the thirsty guests sitting at tables. It was in late September of 2001 that the Cold Spring Maennerchor attended Oktoberfest as a part of their EURO III tour. The name Maennerchor actually comes from the German word that means Men's Chorus. For over 60 years the Cold Spring Area Maennerchor have carried forward a tradition of German folk-songs and heritage. 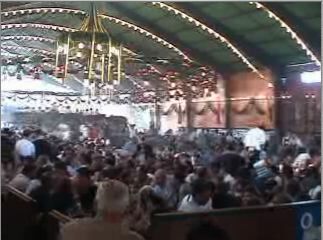 The beer tents, which are in reality very elaborate engineered buildings, all included an elevated band platform in the middle to provide constant music and entertainment for the croud.